Islesburgh Drama Group pulled off yet another stunning performance with their Christmas pantomime Puss in Boots at the Garrison Theatre. 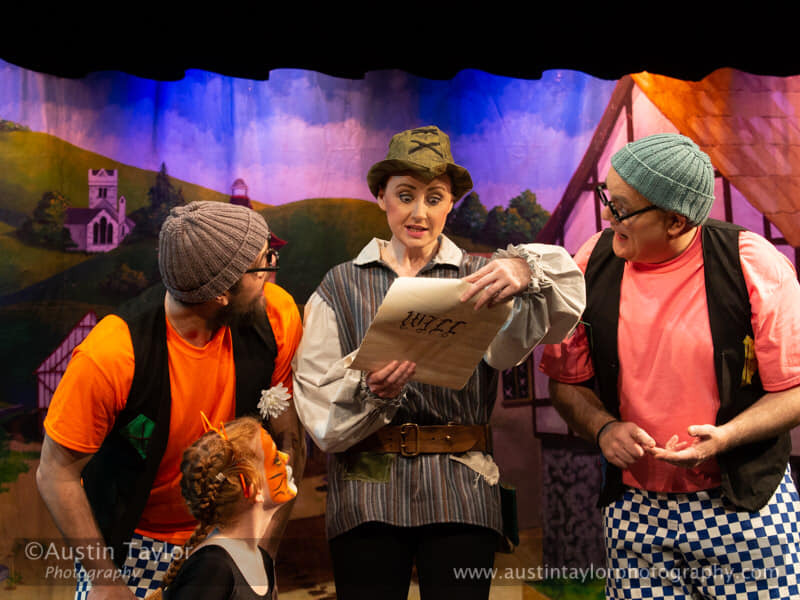 The well loved story, directed and produced by Stanley Manson, had the audience, young and old, laughing, screaming and singing, with never a dull moment. The action veered from the everyday to the ridiculous, frightening and happy. It started with a flash of blue light - the pyrotechnics were excellent throughout - revealing the white-clad good fairy, and a ban and red light introducing Pernicia, the bad fairy. The villagers emerged to share the news that the King (played this week by Manson, previously by Karl Ward) was to visit - and the late millers will was about to be read. His two clueless sons, Jethro and Jasper, arrived on scooters and discovered they were rich. But although their stepbrother Jack (Donna Marie Leask) was only left with a cat, the white fairy promised him good things. The cat later transformed into a walking, talking, clothed and booted creation, who outwitted everyone to enable his bright young master to marry the princess. But first we met the King and Queen (Jennie Atkinson), who very effectively spoke in a clipped posh accent and carried the traditional handbag. And then the Ogre Grimgrab - with a burst of threatening music from musicians Chris Horrix, Douglas Johnston and John Johnson, whose music created the atmosphere throughout. "What are you lot doing here?" the hateful green-faced ogre (Bob Skinley) demanded of the audience. He too had designs on Princess Esmerelda: "When an ogre falls in love it is for ever" he said. But he was shunned by the royal party on arrival in the village. The cat's first ruse was to offer them some rabbits and there were moments of real beauty in the woods at night with the young rabbits and creatures dancing with sparkling butterfly wings against a blackened stage. Jack naturally succeeded in this endeavour, to the music of the Teddy Bears Picnic, whereas Jasper and Jethro failed. "We'll bomb the burrow" they said, but two grown up scary black masked rabbits chased them around the auditorium - the start of lots of interaction with the audience. The hopeless brothers remerged bandaged "It's a good thing we saw those nice people from Island Medics" they said. Enter the aptly named King Wally and Queen in hilarious bathing suits. The maid was told to try the water, to lots of protest "I don't want to, oh no I dont': to the audience rejoinder "Oh yes you do". But proceedings were interrupted by screams: "Has Boris Johnson fallen off his bike" as the cat had arranged for Jack's clothes to be stolen - later to be arrayed in spare finery from the royals, making him a suitable husband for the Princess. Meanwhile red flashes and scary music heralded the ogre in his castle. "There's been a change of groom" he said. He and the bad fairy plotted to kidnap the princess and issued detailed instructions to Jethro and Jasper as to which bed she would be sleeping. Naturally it all went wrong - the cat was in the royal bed and the Queen decided to bed down with the princess in the other one. First, however, she sang a raucous lullaby and did "exercises" to the tune of Swan Lake to great hilarity. The brothers grabbed the cat: She's struggling like a wild cat" and the Queen distraught said "Where's Jimmy Perez when you need him?" The Royals with the King in his nightcap ran to search a wild wood with torches illuminating the complete darkness Solders seeking the princess were behind them in the panto's scariest moments, with loud and prolonged screams from the audience, which included "special guests" from Mossbank Primary School. And the screams increased as the solders ran around the theatre. The Ogre meanwhile used foul means to win the princess. He changed into a lion to scare the cat, then was tricked into becoming a mouse and was easily dispatched. Lots of audience signing of Where Did You Get that Cat (Hat) followed before the royal wedding. The action throughout was brisk with clear dialogue and gutsy singing, making for a brilliant production and a most enjoyable evening. Hello and welcome to the first of our Behind the Scenes series of blog posts. 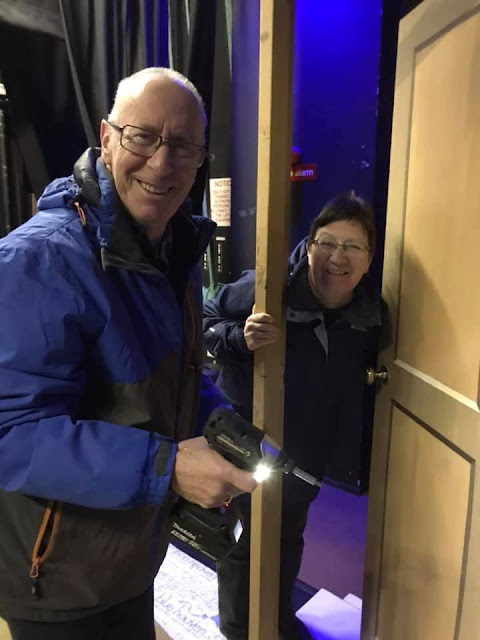 Now that the (fairy) dust has settled it is time to share some of what goes on behind the scenes to bring you a successful production. So first up is MAKE UP! 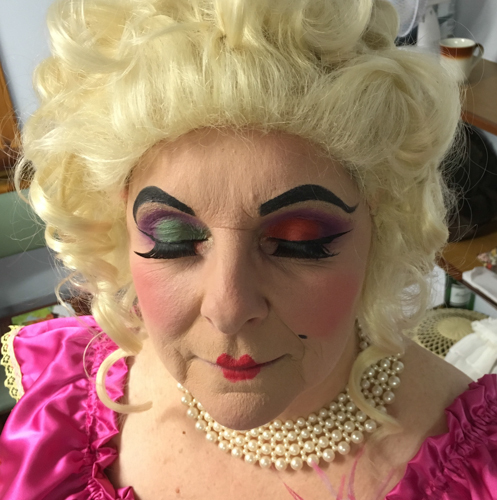 I am sure you cannot have failed to be absolutely blown away by the fabulous make-up created for the pantomime by Babs Clubb and her team. 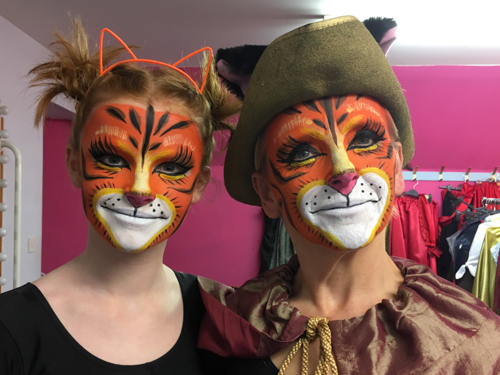 A lot of preparation went into designing the make up for each character and make up sessions before the performance started at 5 pm in order to have everyone made up by 7.15 pm. Queen Wendy (Jennie Atkinson) Make Up by Thea May Groat Fabulous blending of eye colours and recreating the shape of the face by raising the eyebrows. Babs starting the make up for Mandy. Last week we said our "farewells" to George and Marion Webster who have both been such an integral part of our Group for the last thirty plus years. They will both be greatly missed by us all. 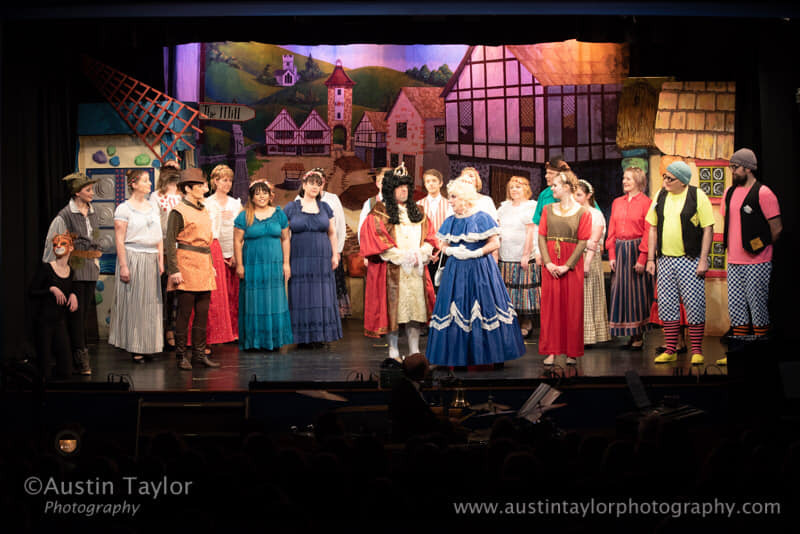 Now we do all count ourselves as one big family in IDG but when we actually thought about it one night in the dressing room we realised that there were quite a few generation links in the cast and production team.